Aluminium is a popular material in the world of home improvements for a multitude of reasons. Structurally secure, thermally efficient and easily customisable, products manufactured using this incredible material outclass the competition in almost every way. 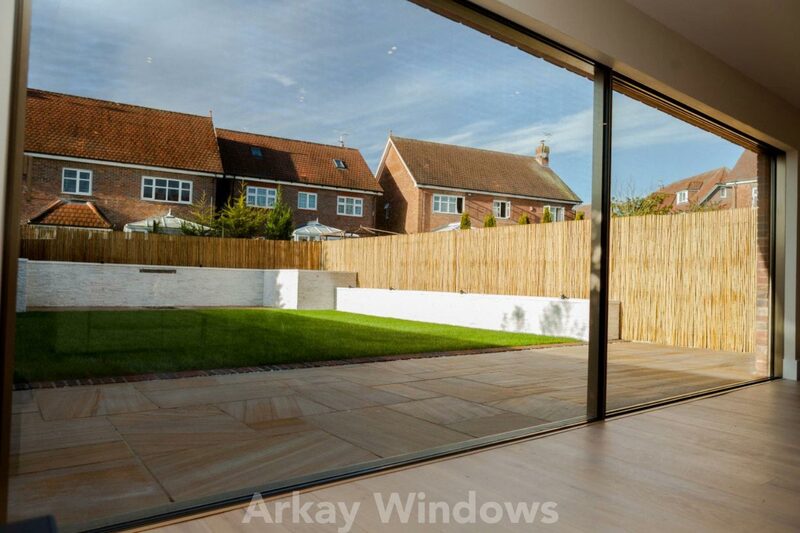 Meanwhile, the patio doors design we use at Arkay Windows provides expansive views and a unique sliding functionality that can add a whole new layer of character to any property style. If you have a beautiful garden space that you’d like to show off or are perhaps lucky enough to have a wonderful view of the hills or ocean from your home, then our aluminium patio doors are perfectly suited to you. Consisting of multiple large glass panels that slide effortlessly between one another, these contemporary masterpieces are an eye-catching addition that will impress your visitors and increase the value of any property. What Should You Expect From Aluminium Patio Doors? As with almost any aluminium window or door design, there are a couple of specifications that are more important than anything else when it comes to home improvements. Security is arguably top of the list, and the prospect of replacing a solid doorway with a glass one can be daunting at first. However, there’s no need to worry; our modern aluminium patio door glass is crafted from the latest double glazing, which is so thoroughly reinforced that the difference in strength is negligible. This results in a patio door that has been designed to protect you. However, this same double glazing that keeps you safe from intruders also keeps you warm throughout the winter. Our vacuum-sealed glass traps heat and prevents cold ingress, meaning that you’ll quickly start to experience a warmer property without having to double down on central heating. This will subsequently start drastically reducing your energy bills as your home warms itself naturally. If you have decided on investing into an aluminium patio door, why not consider our InfiniGLIDE6 sliding system? Built onto dual stainless-steel rails with two double stainless-steel rollers on either side of the vent, this sliding door design slips away effortlessly and silently. If you’re excited by modern technology, this particular range even includes an electrical motorisation function on request! The InfiniGLIDE6 design is also great at combining indoor and outdoor spaces, with the large glass panels offering a stunning view of the outside. As the name ’patio doors’ may suggest, they blend perfectly onto garden patios, meaning that if you’re looking for a space to relax and entertain guests in the summer, this door design is right for you. The InfiniGLIDE6 range even allows for customisation, with handles that can be placed depending on your preference. 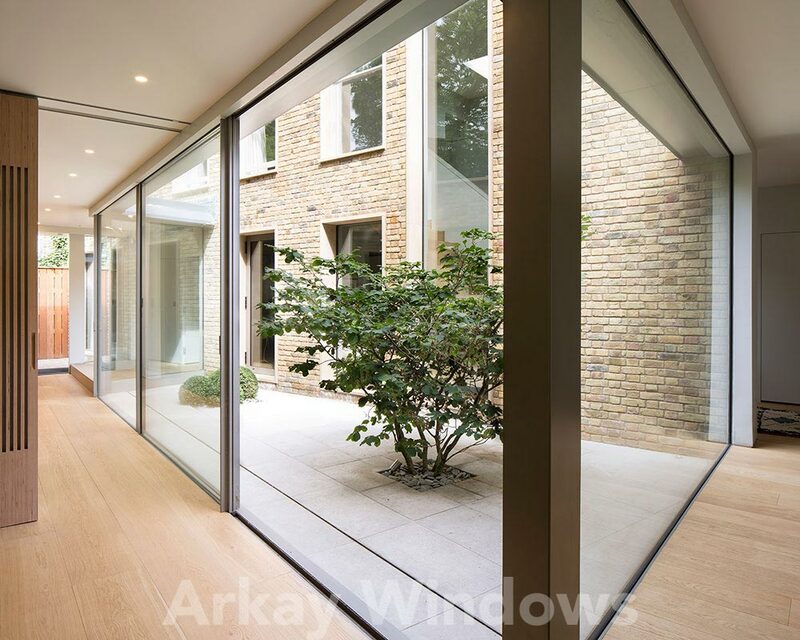 Our aluminium patio doors can also be used to split a larger room into two separate living spaces, while simultaneously allowing them to be connected again in seconds thanks to the large opening provided by the sliding functionality. These are all just a few of the reasons why this door design from Arkay is the go-to choice for the modern homeowner. The next time you’re working on your property, consider aluminium patio doors for contemporary home improvements. If you’re interested in expanding your horizons with an InfiniGLIDE6 aluminium patio door, you’re in the right place. We manufacture patio doors at our on-site state of the art facility. Each profile passes rigorous quality and assurance tests before they are sent out to your installer. If you are looking for the cost of an aluminium patio door, use our quote system to request a free quote! Just let us know if you are a trade customer for a supply only price or a customer that requires fitting costs, and we can get back to you. For more information on our aluminium patio doors & other door styles, please view our exquisite range of doors. Be sure to view our aluminium patio door videos!